The recent Adi Tantimedh interview with Alan Moore has caused… well quite considerable amounts of comment, criticism, agreement and parody. But was Moore’s reaction to suggestions of Watchmen 2 really so unexpected? After all, it was the reason he left DC Comics in the first place, back in the late eighties. 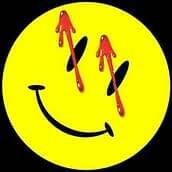 Often attributed to the Watchmen promotional/non-promotional buttons, the fuss over DC’s compliance with suggested changes to the ratings system in comics or the lack of DC’s willingness to renegotiate terms with Alan post-Watchmen success, and while all these were clearly factors, Moore did set it down in an interview in The Comics Journal conducted by Gary Groth. Here is the relevant paragraph.